The College is located on the traditional, ancestral, and unceded territory of the hən̓q̓əmin̓əm̓ speaking Musqueam people, one of British Columbia’s First Nations. 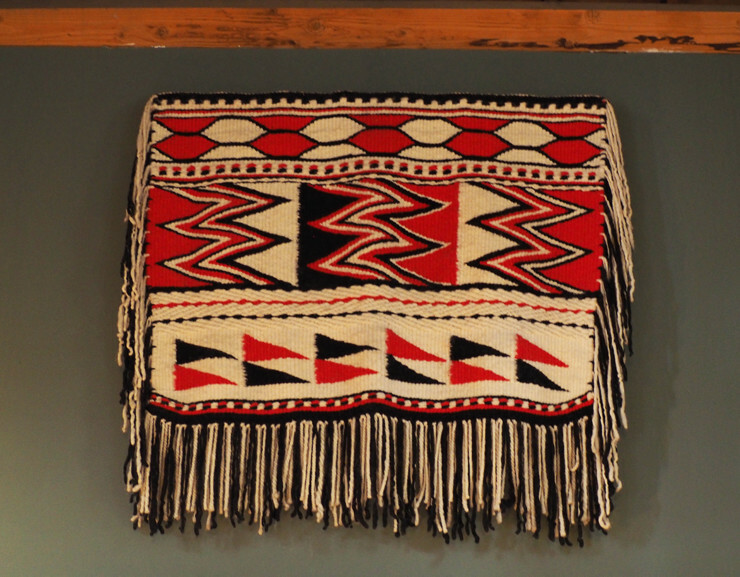 The College honours this association with a Musqueam weaving that hangs at the east end of the Great Hall. Cecil H. and Ida Green. The College was made possible through a generous gift from Dr. Cecil H. Green in 1990, which was matched by funds from the Province of British Columbia as part of the ‘World of Opportunity’ fundraising campaign, led by then UBC President David Strangway. Dr. Green studied liberal arts and applied science at UBC from 1918 to 1921, then moved to the Massachusetts Institute of Technology to complete a bachelor’s and master’s degrees in electrical engineering. After graduating, he co-founded Geophysical Services Limited, a company that eventually became the hugely successful Texas Instruments. Dr. Green went on to become a world leader in education and medical philanthropy, giving back to his alma mater in major ways. In 1965, he and his wife, Ida Green, made a donation to UBC for the purchase and upkeep of Cecil Green Park House, an oceanfront mansion next door to the present-day College property. 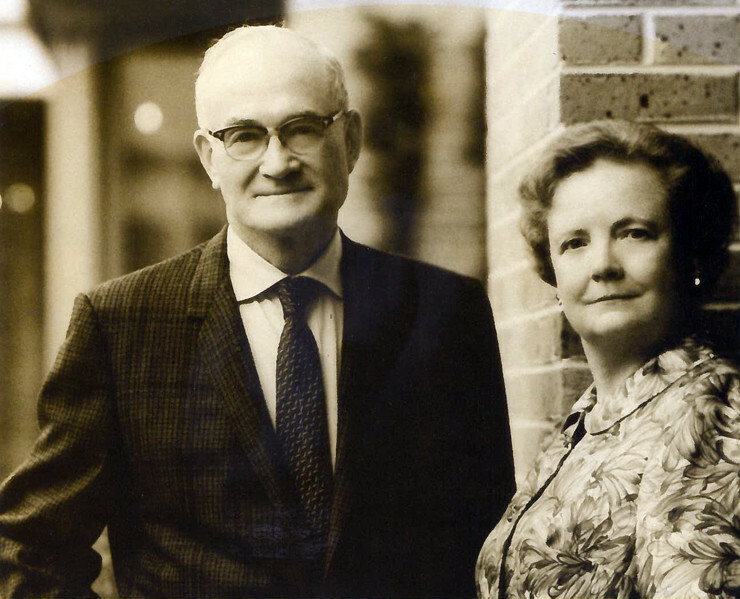 In 1972, the Greens endowed the Cecil and Ida Green Visiting Professorship program, which is now administered through the College. In the early 1990s, Dr. Green had a vision for an interdisciplinary graduate college at UBC where students and faculty could exchange big ideas, collaborate within the academy, and beyond. On November 22, 1993, that dream was finally realized. At the Green College opening ceremony, Dr. Green emphasized the College’s innovative, cross-disciplinary approach. "The complex nature of the modern world demands intellectual flexibility," he said. "It’s no longer good enough for a brilliant man or woman to be completely immersed in one subject for his or her entire academic life." "Engineers need to understand the ebb and flow of human history; physicists need to know something of the dynamics of the human psych; doctors need to understand the subtleties of literature and art." Graham House is the central meeting space of the College, which houses the Great Hall where residents and guests come together to dine. The building was designed in 1915 for the widowed Mrs. Lily Alice Lefevre, a philanthropist and poet, by the architectural firm Maclure and Fox. In 1964, the UBC School of Social Work took occupancy of the building and remained there until 1992 when the site was redeveloped to house Green College. The original character of the old house was carefully preserved during renovations. Under the direction of architects Birmingham and Wood, in association with Paul Merrick Architects Limited, the residential buildings were designed to reflect the style of Graham House. The architects wanted to design a version of the old-style college quadrangle—a courtyard surrounded by several buildings. This design would avoid the exclusive and confined effect of traditional academic residences in England (sometimes known as the “Oxbridge model”). Instead, the College’s residential buildings would reflect the west coast values of openness and informality. A tall, decorative gateway was installed at the entrance to the College to create a boundary and sense of common purpose. It was also designed to be a welcoming structure with its transparent form, embodying hospitality. 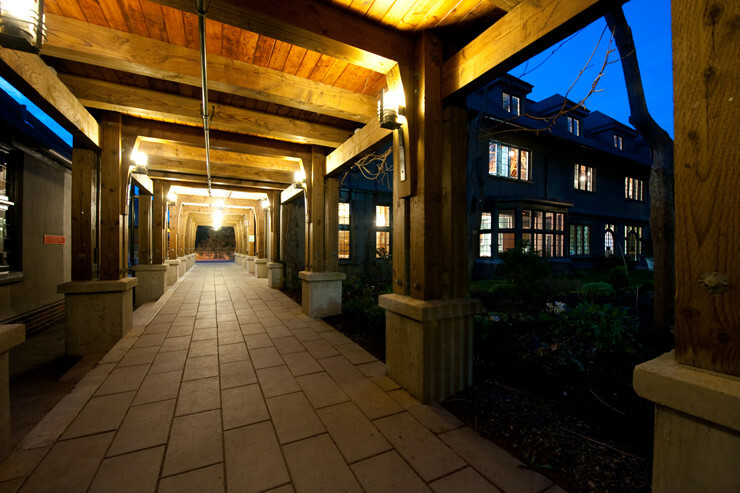 These new College buildings won a Merit Aware from the Canadian Wood Council in 1994.